Plovdiv, Bulgaria, is one of the oldest cities in Europe with its history dating back to around 6,000 B.C. This ancient city boasts Roman ruins and a stunning Old Town of timber-framed houses and cobbled streets. The city prospered after the fall of the Ottoman Empire as the wealthy Bulgarians started restoring the Orthodox churches and architectural buildings. However, it didn’t make it as the new capital of Bulgaria since it remained part of the Ottoman province for a further 7 years, thus leaving Sofia to become the new capital city. Today, Plovdiv is a thriving city with a laid back atmosphere and plenty of architectural buildings. If you’re planning to spend a day in this historic town, take a look at our recommendations featuring the best sites to visit in a day. Tip: Download the Plovdiv map on your smartphone and save it as image. You can always use it offline whenever you need to. The Old Town of Plovdiv is full of cobblestone streets featuring 19th century homes, which are mostly museums now. As you take a walk through this historical part of the city, you can catch a glimpse of these character houses from the Renaissance period with their handmade wooden furniture and framed windows. You will also come across a very interesting museum called, Atanas Krastev House. This characterful house was constructed back in 1793 and is the oldest structure that’s open to the public as a museum. Another beautiful building that's a must-see in the Old Town is Balabanov House. The house was sympathetically reconstructed during the 70s. On the lower floor, there is an impressive collection of paintings by local artists, while on the upper floors, you can find many antiques and carved ceilings. This is where the nostalgia of the Old Town meets contemporary art. Another famous museum is the Regional History Museum in the Old Town. It was founded back in 1951. This museum is home to Plovdiv’s cultural treasures dating from the 15th century to the 20th century. The Old Town is clearly where history meets culture and this is evident through the remains of the Roman and Byzantine fortress walls that surround this part of the city. The Ruins of Eumolpias are situated here and offer the most spectacular views on a hill. The ruins of this fortress are 203 metres high and are the remains of the Thracian settlement in 5,000 BC. 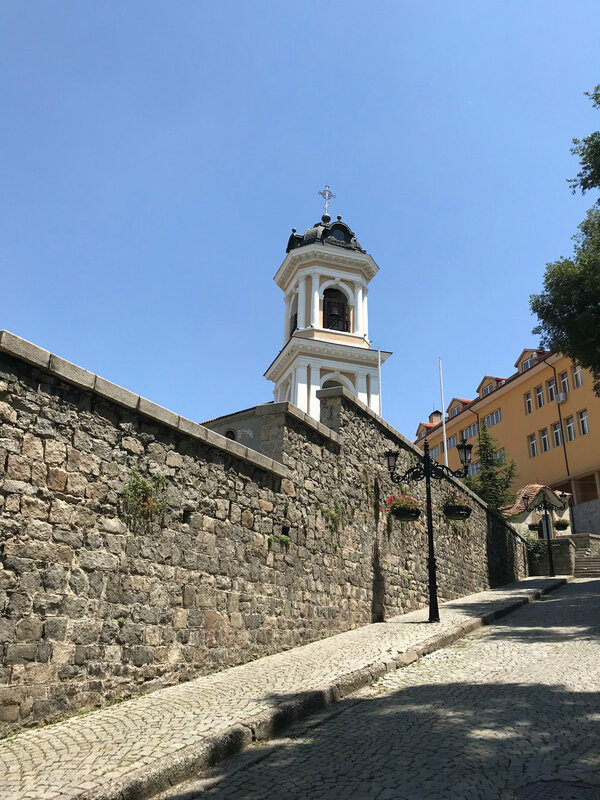 As you stroll through this historical part of Plovdiv, you will come across the stunning church of Sveti Konstantin & Elena. This is the oldest Christian church in Plovdiv and situated in the centre of the Old Town. It is open for visits from 8am to 8pm. Another beautiful church on your way Sveta Bogoroditsa. It is a 12th century three-nave church with a stone staircase located at the edge of the Old Town. The church is now home to colourful murals and paintings that were saved by the Bulgarian liberators during the Ottoman era. Located near Plovdiv’s central square, this beautiful park was created in 1892 by the Swiss architect, L. Chevalas, and is proclaimed as an art monument of landscape gardening with a singing fountain situated at the end of the promenade. In the heat of the summer, seek shade in this lovely park and take delight in the well-kept flowerbeds and fountains. There is also a light and sound show taking place once a week. The Garden of Tsar Simeon has undergone extensive improvements during the last few years and is considered as the prettiest place to stroll in Plovdiv. It’s definitely worth spending an hour or two here before going to the centre of the town for a spot of shopping. 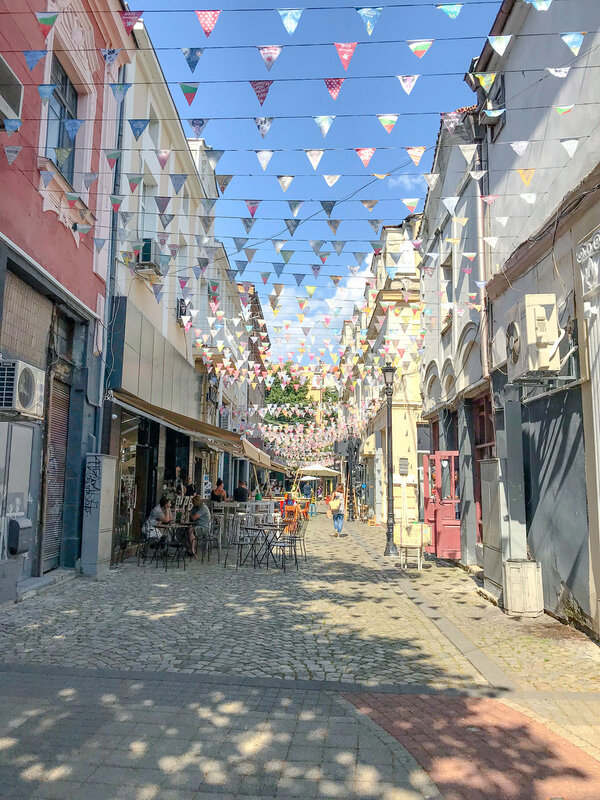 Plovdiv’s Main Shopping Street is one of the longest pedestrian streets in Europe with 1,750 metres in length loosely joining the Old Town with Tsar Simeon Garden and Kapana District. This is where you can shop from numerous boutiques, cosmetic shops, bookstores as well as enjoy the unique sights of the city like the Dzhumaya Mosque. This mosque is Plovdiv’s main Muslim temple and situated right in the centre of town. During the Ottoman reign, the Sveta Petka Tarnovska Cathedral was demolished by the Ottoman army and replaced by Dzhumaya Mosque. This building attracts thousands of visitors a year and is free to enter for all. The Main Street is perfect for a romantic stroll throughout the day or night. Don't forget to take a photo next to Milyo Statue before you leave. This sculpture was made as a remembrance of Milyo The Crazy. He was Plovdiv’s joker and some say a rather mentally unstable man. His statue has today become the symbol of the town’s spirit and a tourist attraction. Afterwards, rest your feet and enjoy a cup of coffee with banitsa in one of the cafes before heading to the Roman theatre. The Ancient Roman Amphitheatre in Plovdiv is located in the city centre and one of the best-preserved theatres in the world. 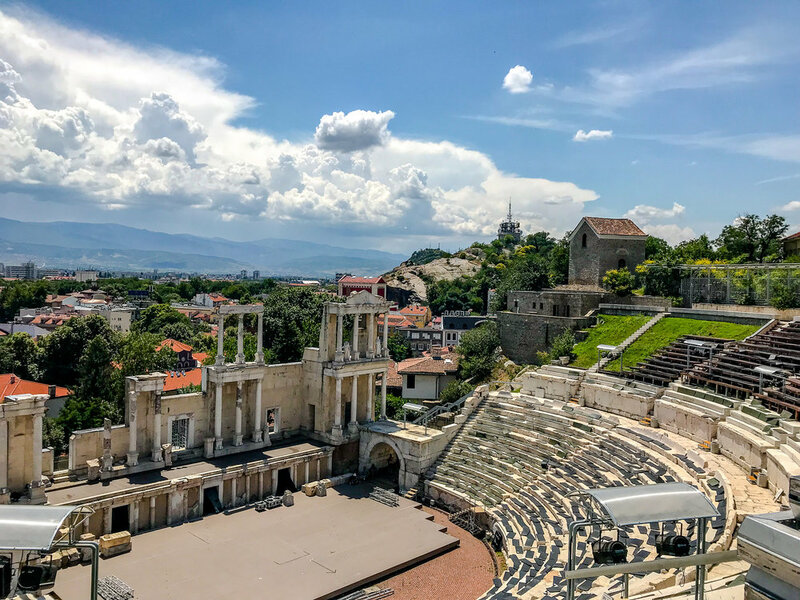 This site is perhaps one of the most impressive places to see in Plovdiv and it is used for a variety of musical shows and performances during the summer months. Every year, the International Folklore Festival and the International Festival of Jazz attract hundreds of spectators from all over the country. These are 3-day events that take place in late autumn. This beautiful building with its decorated Baroque-style exterior was once owned by a wealthy merchant before becoming an ethnographic museum. Each room in this house is carefully laid out in a typical Rhodope villager’s living style with shaggy rugs and wooden stools. There are also musical instruments, traditional crafts, national costumes, and pottery on display throughout the museum. Take the time to sit and enjoy the tranquility of this museum’s garden and if you’re lucky, you might even witness a classical folk music performance. The museum is open from 9am to 6pm, Tuesdays to Sundays. After you’ve visited the museum, walk up to Hissar Kapiya Street, where you will reach Nebet Tepe or Hill. This is a Roman fortress that offers stunning views of the city as well as the Maritsa River. It makes a perfect photo opportunity before you head to another famous part of the city. Nebet Tepe is where Plovdiv was founded as its earliest settlements date back to 4,000 BC. Along the way, you will come across the Stadium of Philippopolis, which was constructed in the beginning of the 2nd century AD. It is located in the northern part of Plovdiv and surrounded by walls between Taksim and Sahat Tepe. This stadium has up to 30,000 seating capacity and is 240 metres long. The Trap or Kapana district is located between Nebet Hills and Taksim on the northeast of Dzhumaya Square. It is beautifully decorated with colourful flags hanging down between the buildings and there are some great restaurants and bars to check out in this area. The Trap is an ideal place to get lost in for a few hours not only because of its small winding cobblestone streets but also because of the special atmosphere that is filled by its craft shops and art galleries. As soon as the night falls over the district, you will be drawn by its maze of lights and the bustling sounds from the bars. Exploring this district is a perfect way to end your day in Plovdiv. Downtown Family Hotel: We had the best sleep in this hotel because it is not located on the main street. The rooms are newly renovated and the staff (one big family) is very friendly. The location is excellent, just 5 minutes away from town centre. The big plus for this hotel is how quiet it is. Park Hotel Plovdiv: Another nice and modern hotel in the heart of the city but away from all the noise. It is located in Lauta City Park and faces a natural forest. It also offers spa services for relaxation and seclusion. Avion Hotel: This simple yet elegant family hotel is on the other side of the river and within easy reach of town centre and the Main Shopping Street. We liked it for its huge rooms and a cosy kitchen with 2 balconies. The rooms are newly renovated and the staff is very kind and friendly. The only down side to this hotel was that we could hear the passing cars from the main road the whole night. The hotel we don’t recommend is the Grand Hotel Plovdiv: This huge and impersonal hotel has outdated rooms and the price is too high for what you can get in other hotels. Eating in Bulgaria is a unique experience and one of the many reasons to visit this beautiful country. Bulgarian cuisine is a combination of Turkish, Greek, and Persian dishes that consists of local produce served with alcoholic drinks, such as the famous rakia. The following are some of the best known Bulgarian foods that you must try on your visit to this country. Ayran. This is a yoghurt-based drink mixed with water and salt. Tarator. Cold cucumber soup served as an appetiser. Moussaka. This dish is made with potatoes, minced meat, and tomatoes topped with white sauce and baked in the oven. It can be cooked with zucchini instead of potatoes. Sach. This is a very traditional way of cooking in Bulgaria. The sach is a thick and very heavy dish made by hand from a special type of clay. This dish can be used both on direct heat as well as in the oven. The most typical foods that are cooked on the sach include meat, such as pork, lamb, or chicken, baked with vegetables and potatoes. Bulgarian bean soup (Bob Chorba). Bean soup is another traditional Bulgarian cuisine that’s both easy to prepare and can be enjoyed any time of the year. The classic recipe includes vegetables and beans slowly cooked with peppers and mint and served with pitta bread. Kavarma. This typical cuisine is a tasty slow-cooked stew with either chicken or pork and vegetables. Mish-Mash. A traditional type of Bulgarian omelette with red peppers, eggs, cheese, and tomatoes. Shopska salad. This is a very popular light summer salad with tomatoes, cucumbers, bell peppers, onion, olives, and topped with finely grated feta cheese with olive oil and salt seasoning. Snejanka salad – This basic salad is a favourite among Bulgarians and tourists alike. The word Snejanka means “snow white”. 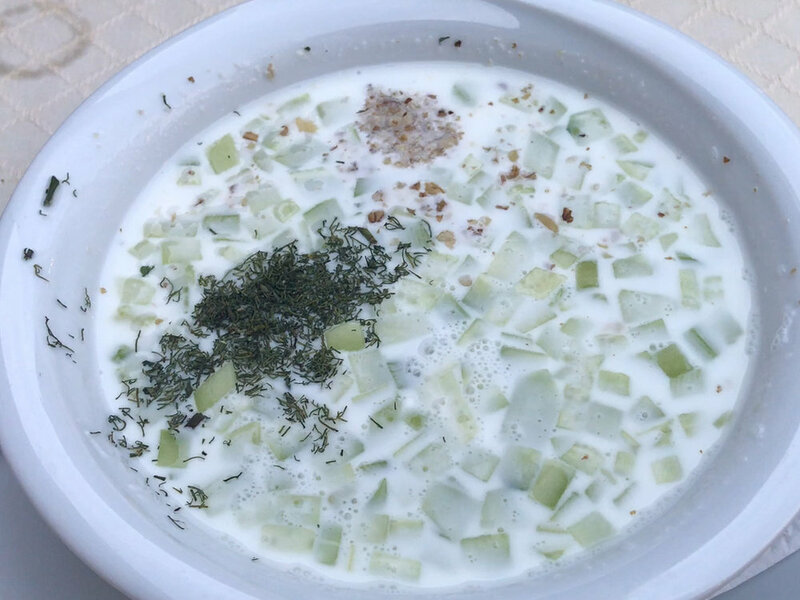 The ingredients are just thick yoghurt and finely chopped cucumbers with dill and crushed walnuts on top. Sarmi (stuffed grape leaves or cabbage) The Bulgarian Sarmi is made with minced veal, minced pork, rice, onion, herbs, and carrots. There is also the Turkish and Greek version with different stuffing. Stuffed peppers. This dish is similar to Sarmi but instead of cabbage or vine leaves, peppers are used. You can have a choice between the vegetarian stuffed peppers with rice, vegetables and cheese, or the meat version with minced veal and potatoes. Banitsa. This is a Bulgarian pastry consisting of eggs and cheese. You can also find white cheese and spinach banitsa. A high-calorie food but very popular in Bulgaria. Boza. Similar to malt drink, this sweet-sour fermented beverage made from wheat or millet is very popular in Bulgaria. Boza is rich in vitamins, carbs, and probiotics. The Hemmingway Restaurant in the centre serves local Bulgarian food. In the Old Town the restaurants are not so good, but we did two that weren't too bad: Alafrangite Restaurant and Cherpak. They serve traditional Bulgarian food at reasonable prices. It's the cheapest country in Europe. In comparison to other European countries, Bulgaria is the cheapest country. Only Macedonia follows closely behind. Bulgaria is still very much unspoiled by tourists, hence the reason it has remained one of the few countries in Europe with its own currency. The hotels, drinks, food, and even properties are much cheaper than anywhere else so if you want a true bargain, catch a flight over! It's historical with plenty of ancient buildings. As evidenced by the famous Roman amphitheatre in Plovdiv, Bulgaria has a post-Thracian and Roman past. This theatre was built in the 2nd century AD and one of the best preserved historic sites in the world. It is still used today for shows and accommodates up to 3,500 people. To name a few more examples of historical sites, the Alexander Nevsky Cathedral in Sofia is a huge church constructed in 1912 and one of the biggest Eastern Orthodox churches in the world. It is 3,700 sqm and can hold up to 10,000 worshippers. Another fine example is the Thracian Tomb of Kazanlak, which is one of Bulgaria’s 9 UNESCO World Heritage Sites. It's close to Greece and Turkey. From Bulgaria, you can easily take a one-day road trip to Greece or Turkey as they both share borders with this country. Great place for sampling traditional food and wine. Bulgarian food is famous for its quality and taste since it’s locally produced. The most popular forms of meat are pork, chicken, and veal. Lamb is mainly served during spring (in May.) Of course no visit to Bulgaria would be complete without sampling its world famous wines. The Most popular ski resorts in Europe are here. Bulgaria is home to the finest and cheapest ski resorts in East Europe. The most popular are Borovets, Pamporovo, and Bansko. The latter is an old town situated in the beautiful Pirin National Park, with modern ski lifts and new lodgings. There are more than 120 monasteries. The largest monastery in Bulgaria is situated in the Rila Mountains. Rila Monastery was founded by St. Ivan in the 10th century and is a UNESCO World Heritage Site. This monastery was completely destroyed by fire in the 19th century, but it was soon rebuilt by the Bulgarians. The 2nd biggest monastery is Bachkovo and situated close to the Rhodope Mountains in Plovdiv. Every August, thousands of people attend the special Mass that takes place in this monastery. Further north of the country, the Dryanovo monastery’s amazing architecture will leave you totally breathless. At this monastery, there are guided tours available at the Bacho Kiro Cave as well as camping sites with stunning views. It boasts stunning rose valleys. If you want to take part in the Rose Festival, come to Bulgaria in May or June. This annual festival takes place in the Rose Valley close to the town of Kazanlak. Rose is the country’s national symbol and rose oil is one of Bulgaria’s main exports. Picturesque coastal towns and beaches. Almost a third of the country’s Black Sea coast comprises of sandy and unspoiled beaches with some of the most charming spots like the UNESCO World Heritage Site, Nessebar. If you’re into partying the night away, Sunny Beach is the place to visit. But for peace and tranquility, consider Sozopol. This coastal town is perfect for spending a day on the beach and walking around the Old Town and enjoying the local traditions. The mountains are superb. Bulgaria is certainly not short of mountains. From Rila to Pirin, Rhodope, and Stara Planina, the summits are surrounded by blue lakes and beautiful waterfalls. You can enjoy a hike through Rhodope’s lush forests and take advantage of the best hiking routes in Europe. Plenty of culture and history. Bulgaria is Europe’s 3rd country with the biggest collection of cultural historical monuments. In fact, you will hardly meet a Bulgarian who is not proud of their heritage. It is an important part of their lives and their traditions are passed from generation to generation. Bulgaria boasts thousands of well-preserved landmarks from Roman, Greek, Thracian, Ottoman, and Byzantine civilisation. To truly experience culture and history, a visit to Veliko Tarnovo in Central Northern Bulgaria is a must. This former capital city is around 3 hours drive away from Plovdiv (212 km). There are many museums and monasteries in this 500-year old town with plenty of ancient history just awaiting to be explored! Name Days. Name days are just as important as birthdays in Bulgaria. They are associated with Orthodox patron saints and you will find many people in this country named after saints. On this particular day, a big family get-together takes place in order to celebrate the name. The guests come to the dinner party uninvited and the person celebrating their name must prepare the food and treats for everyone. Baba Marta. One of the most valued traditions is called Baba Marta (Grandma March). This custom starts on March the 1st and celebrates the start of spring. Family members and friends wish each other luck, happiness, and good health by wearing a special bracelet (Martenitsa). You can’t remove the bracelet from your wrist until you see a stork! This bracelet is often seen hanging from blossoming trees during spring. Easter Traditions. Easter in Bulgaria is quite different from other countries. An Orthodox Easter is celebrated by colouring eggs, breaking eggs, and baking Easter breads. According to tradition, eggs must be coloured on Holy Thursday (before Easter Sunday). The very first eggs that’s painted in multiple colours represents Jesus rising from the dead. The egg breaking tradition takes place before the Easter meal and all the family members must tap their coloured eggs against each other. Whoever ends up with the last unbroken egg will have a year of luck to look forward to. Christmas Eve & Christmas Day. Christmas Eve is celebrated with a vegetarian meal. Unshelled walnuts are placed on everyone’s plate. Each member of the family will crack a walnut and if it’s a good one, they will have a successful year. However, whoever cracks a bad walnut is said to have bad luck. Another tradition on Christmas Eve is hiding a coin in the Christmas bread. Whoever finds the coin will have good luck for the new year. Once dinner is over, the table isn’t cleared until the next morning. This is to offer the ghosts of the ancestors to return for a visit before Christmas Day. On Christmas Day, Pork is served as the traditional Christmas dinner. Christmas carol singers (most often men dressed in costumes) go from house to house and sing traditional songs before being rewarded with food. Carnival to Ward Off Evil Spirits. Perhaps one of the most vivid customs in Bulgaria is Kukeri. This tradition stems from the ancient Pagans and is associated with affecting nature through supernatural means. The ritual involves wearing large masks, animal skin, and bells in order to chase away evil spirits and purify the soul. Only men can wear these costumes, and the leader of the group must be a married man. Fire Dancing. Dancing on fire is an ancient Bulgarian custom that’s believed to originate from the Thracians. This ritual takes place on June the 3rd when St. Constantine and St. Helena days are celebrated. These two patron icons are decorated and brought to a spring water before the fire dancers spray holy water on them. This tradition is thought to have also been practiced by the Pagans. Learn basic Bulgarian: If you’re planning to visit the main tourist points in Bulgaria, then you won’t need to speak any Bulgarian or Russian as most people will be fluent in English. However, in villages and less touristy places, you should at least have a phrase book with you. Tips: when you get stuck for words, use sign language. If you bump into someone by accident, don’t say sorry, say ‘opa’! Restaurant service can be strange: When you visit a restaurant with your friends, your ordered meals won’t all come at the same time. They will bring the dishes as soon as they are ready so one of you may end up waiting for some time after the others are served. Don’t confuse ‘yes’ with ‘no’: In most countries around the world, people nod as a yes and shake their heads to mean no. But not in Bulgaria! It is exactly the opposite. If they shake their head, they mean yes, and nod to mean no. To make matters even more complicated, they will shake their head and say ‘da’ (yes) at the same time. This left us very confused in the beginning! Don’t mock the name days: Bulgarians take name days just as seriously as birthdays. It’s a big thing so if they tell you it’s their name day, congratulate them warmly rather than say ‘so what!’. Exchange your euros: While it is true that Bulgaria is in the EU, it’s not part of the Euro zone yet and still uses its own currency, 1 euro is about 2 BGN and you can change your money in most banks and exchange bureaus. Take some cash with you: In large tourist places and restaurants, cards are accepted, however, if you want to buy a souvenir from a local craft shop, you will need to have some cash with you. In fact, it would make things a whole lot easier, especially when you want to explore the country like a local. Don’t take off the martenitsas from the trees: Bulgaria celebrates Baba Marta every 1st of March. This is the date to welcome spring. On this occasion, shops start selling special red and white threaded bracelets, which are worn on the wrist until the trees blossom and then they hang them from the branches. When you see these bracelets on the trees during spring, don’t take them off. They are believed to bring happiness, fertility, and good health. Plovdiv is Bulgaria’s 2nd biggest city, located in South-central part of the country. Plovdiv has a population of around 340,000 with a total area of 101.98 km2. Most airlines fly to Sofia Bulgaria and from there, it’s a 1.5 hour drive to Plovdiv. There is also a small airport in Plovdiv, however, most airlines don't fly from there. When is the Best Time to Visit Bulgaria? The best time to visit depends on the purpose of your trip. December, January, February, and March are the best months for skiing. If you wish to visit the Black Sea resorts, then June, July, August, and September are the most suitable months. If you’re into hiking, camping, or wish to visit the spa resorts, late spring, early summer, or early autumn would be the ideal seasons to come to Bulgaria. The best times to explore Plovdiv would be from mid-April to July, and late august to October. How Much should I Tip in Plovdiv Restaurants and Taxis? Tipping 10% of your taxi bill is considered generous, but for short rides, 1 BGN would suffice. You can tip more if the driver helps carry your bags or offers a good service. Overall, taxi fares are inexpensive compared to other European countries. In restaurants, it’s usual to tip 10% of the total bill. Waiters and waitresses get a minimum wage and they make up the rest in tips. It is also common to tip 1-2 BGN to bartenders. Where to Eat in Plovdiv? Please refer to our list of recommended restaurants. Where to Stay in Plovdiv? Please refer to our list of recommended hotels. Philip II of Macedonia conquered the city in 342 B.C. and named it Philippopolis. In 72 A.D, the Romans captured Plovdiv and named it Trimontium. It became the Thracian capital and the most important crossroad for the Roman Empire. As a result, the city prospered and its vast history can be seen today in the remains of the Roman theatre, stadium, and the Forum. The Bulgarians and Byzantines battled over this city for centuries until the Ottomans arrived and stayed for more than 500 years until Bulgaria claimed its independence. What is Plovdiv Famous For? There are numerous attractions that have made Plovdiv so well-known and loved by the locals and the visitors alike. The historic streets of Plovdiv are famous for their galleries and museums. Most are free to enter and offer the visitor a glimpse into the ancient heritage of the city. The Old Town is another famous part of the city with its cobblestone streets, rustic houses, and historic churches. As Plovdiv is on the main road from Istanbul’s West and on the crossroads of Asia and Europe, its multi-cultural character gives it the fame it deserves. After all, where else in Bulgaria can you find a Baroque Catholic church, A Protestant temple, an Armenian church, and an Ottoman mosque all in one city. What to See in Plovdiv? On the south east of Plovdiv, just outside the town of Asenovgrad, the Bahkovo Monastery can be found. This is the 2nd largest and oldest Orthodox monastery in Bulgaria and integrates the Georgian, Byzantine, and Bulgarian religious traditions. There are many beautiful murals and frescoes that have survived since 1300s including Tsar Ivan Alexander from the 2nd Bulgarian Empire. Situated on one of Plovdiv’s 6 hills, the Clock Tower crowns Sahat Tepe and is one of the most symbolic sites in Plovdiv. To reach this tower, take a walk to the Roman Stadium and from there, it’s literally two minutes away. The Clock Tower is around 300 years old and has been carefully restored over the years. The building has a conical roof on top of a gallery. The clock was installed back in 1883 and crafted in Austria. After you’ve explored all the ancient ruins and churches in Plovdiv, you might need a change of scenery. The city’s airport will catch your attention thanks to its intriguing communist past. There is a collection of old fighter jets that you can get right up close. Don’t miss the 1938 German seaplane, which is the last surviving plane in the world. What are the Best Plovdiv Tours? You can explore the beautiful Rhodope Mountains on a guided horseback riding tour. You will learn about the horses and how to saddle up before making your way to Galabovo village, where you will trot through scenic forests. For an ultimate escape from the tourist trail, take this guided day tour to explore Plovdiv’s 13th century castle called, the Asen’s Fortress. The tour also includes the famous 11th century Bachkovo Monastery, where you can admire the natural bridges and frescoes. This guided tour will take you through different wine cellars and wine bars in Plovdiv for a spot of wine tasting. The 3-hour exclusive cultural tour is ideal for wine lovers and is in the language you speak. For those who don't wish to pay money to join a free Plovdiv tour. This is a very informative tour organised by local students and offered in English. You will spend up to 3 hours learning about the history and culture of Plovdiv. The student guides will take you through the Old Town and show you the most famous sites. Although the tour is free, a little tip like 5 BGN would be appreciated by the volunteer guides. How Far is Plovdiv From Sofia? Which UK Airlines Fly to Plovdiv? UK flights to Plovdiv are run by Ryanair from Stansted Airport. Plovdiv Airport Bulgaria is the 4th busiest airport with flights to and from Italy, Belgium, UK as well as domestic flights to Burgas and Sofia. How Far is Plovdiv From Sunny Beach? How Far is Plovdiv From Sozopol? Plovdiv is a safe town just like any other place in Bulgaria. Visitors should still use the same caution as they would in their own country by not flashing their cash around and keeping their personal belongings out of reach from pickpocketers. How Many Days to Explore Plovdiv? 1 day is sufficient to explore the city's main attractions, but if you wish to travel to other parts of the country, you will need up to 5 days. Is There a Train From Plovdiv to Istanbul? Yes. The night train runs from Istanbul to Plovdiv and back. But you must take a transfer bus along the way. For convenience, it’s best to take the bus, which is much faster. It takes 4 hours to reach Edirne and a further 3 hours to reach Istanbul. Is There a Train From Sofia to Plovdiv? Again, it’s best to get the bus since the train station in Sofia can be confusing for visitors. You can reach Plovdiv by the regular buses that run every hour until 8pm. Sofia Central Bus Station has recently been renovated and has comfortable amenities, such as ATMs, Cafeterias, money exchange bureaus, etc. You can buy your ticket from either the ticket kiosk or directly from the driver. What is the Time Zone in Bulgaria? Bulgaria is GMT/UTC + 2h. What is the Weather in Plovdiv Like? Plovdiv has a sub-tropical climate with 4 distinct seasons. Spring (from March to early May) is cool with the most rainfall than the rest of the year. Summer (from mid May to September) is dry, hot, and sunny. The average temperatures reach up to 34 degrees Celsius. Autumn begins from late September until end of October. Days are relatively warm and nights are chilly. It doesn’t get frosty until beginning of November. This is the start of winter with snow of up to 5cm and average temperatures of -4 degrees Celsius. However, the snow can reach up to 50cm or more, especially in the nearby villages.